Who could resist an edible green that tastes like spinach and also happens to be an easy-to-grow perennial? One that can be eaten as an asparagus-like sprout in early spring, as a cooked green until autumn frosts, and whose seeds (like those of its cousin quinoa) can be used as a grain in winter? 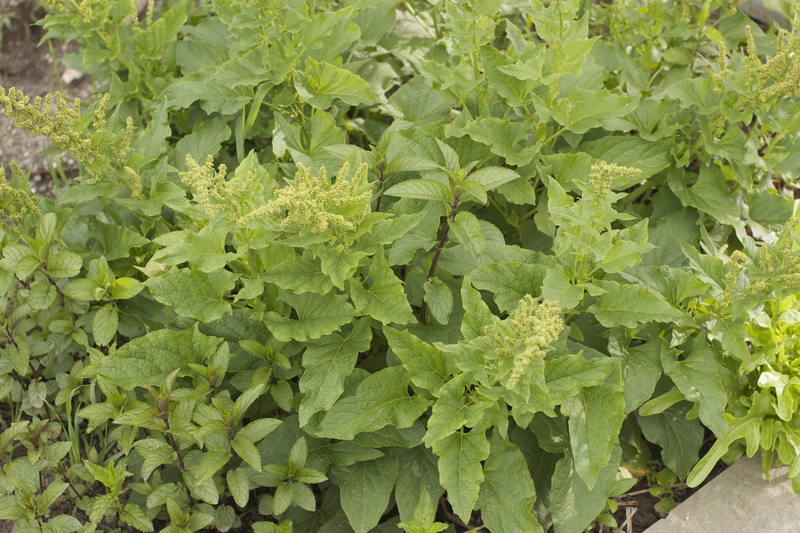 But many gardeners and local food lovers have never heard of Good King Henry, (Chenopodium bonus-henricus) a member of the spinach and beet family also known as Lincolnshire spinach, fat hen and perennial goosefoot (Chenopodium, its family name, means goose foot). Happily, Good King Henry is becoming better known, perhaps because nearly every book about permaculture and perennial vegetables mentions it. I first discovered Good King Henry in the Fedco catalogue ten years ago; they still sell it for all of $1.30 a packet. Good King Henry seed, like that of many perennial plants, likes to be fooled into thinking it has been through winter before it will sprout. The trick is to “stratify” the seed by tucking it into a plastic bag along with a little moist potting mix, then popping it into the refrigerator for a few weeks. When the seed is returned to room temperature, it thinks spring is here, and comes up. Sometimes it takes two trips to the refrigerator before perennial seeds wake up; I’ve learned to be patient and ever-optimistic when trying to start finicky plants. For years my home-grown Good King Henry, though it has a reputation for being a garden thug and over-running its neighbors, looked wan and spindly. Turns out I planted it in too sunny and dry a spot. When moved to a place with half a day of shade, it quickly began filling up the bed. Luckily I’d planted it alongside mint, another garden thug, and the two plants seem to have called a truce. Good King Henry also drops lots of seed that sprouts readily when exposed to the natural temperature fluctuations of a garden, so if you want to keep it in check, harvest the flowers (which are edible). Like its cousin spinach, Good King Henry contains a great deal of oxalic acid, enough that eating it raw might make your stomach hurt and your teeth feel stripped of enamel, so it is always cooked. In early spring, its unexpanded sprouts are picked at about 5 inches tall and and then steamed like asparagus (hence another of its nicknames, “poor man’s asparagus”). In Europe gardeners blanch the sprouts by piling the Good King Henry bed with a deep layer of mulch in fall. When the white tips poke through in spring, the mulch is pushed aside to reveal harvest-ready blanched sprouts. Both the leaves and flowers can be eaten, steamed or blanched first to remove some of the oxalic acid. Use Good King Henry in any recipe that calls for its relatives, spinach, chard and beet greens. 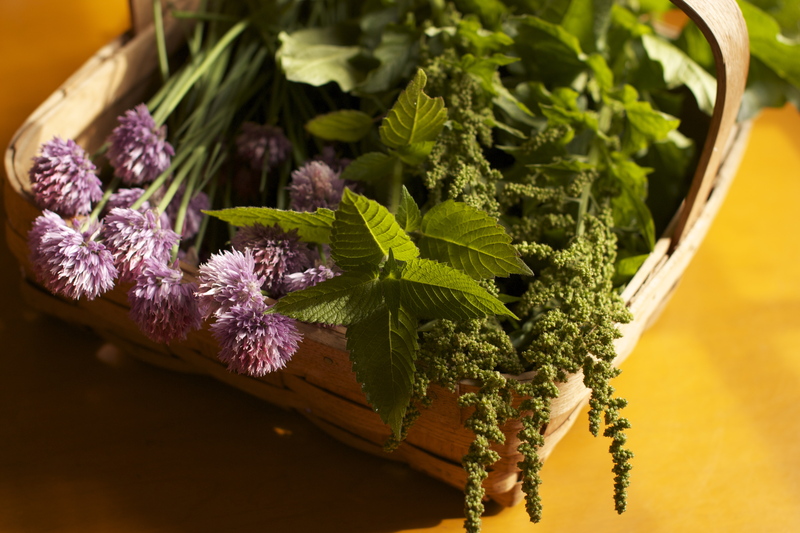 Or use it to replace wild greens, such as nettles and lamb’s quarters (another relative). I have never harvested the seeds of Good King Henry to use as a grain, but I’ll give it a whirl this fall and report back. If you’d like to try them, keep in mind that like unprocessed quinoa, Good King Henry seeds are coated with bitter saponins and must be soaked and rinsed to remove them before being cooked. Here’s a delicious way to use Good King Henry, a simple sauce made of spring greens cooked with garlic and olive oil served over pasta along with a contrasting silky sauce made of feta and cream. 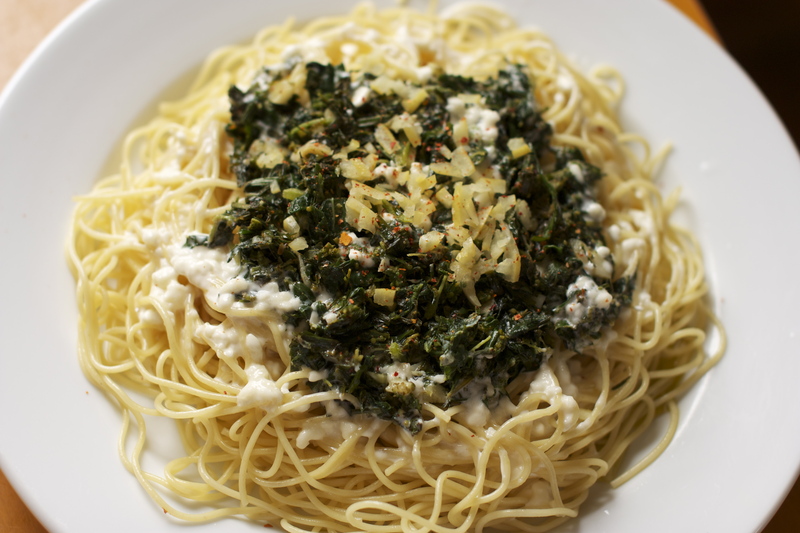 If you’re avoiding fat, skip the cream and just crumble a little feta over the top of the greens and pasta. And if you’re avoiding dairy, omit the cheese altogether. In any case, serve the pasta with a slice of lemon to spritz over the top – it adds just the right something. Cook the pasta according to the package directions. Divide it between four plates. Top each serving with Spring Greens, then drizzle Feta Cream over the greens and pasta. Top with a sprinkling of chopped preserved lemon and a sprinkling of red pepper flakes, if desired. Place a few slices of lemon on each plate, if desired, for diners to squeeze over the pasta to taste. Serve immediately. Put the lid on a large pot of cold, salted water and bring it to a boil. Meanwhile, pull the leaves and flowers from the stems of the Good King Henry and wash in a bowl of cold water. Do the same for the other greens – if using nettles, be sure to wear gloves to harvest and prepare. Blanch the greens in the boiling water for a few minutes, until they turn bright green. Use tongs or a slotted spoon to remove the greens from the hot water and submerge them in cold water to stop the cooking. Remove them from the cold water, squeeze them to remove some of the moisture in them (but not until they are completely dry). With a chef’s knife, chop the greens a bit, then set them aside. In a large, non-reactive skillet, heat the olive oil over medium heat, then add the chives and garlic. Let them cook until the garlic is getting soft, then add the greens and lower the heat a little. Allow the mixture to cook until it is heated through, but not dry, then stir in the lemon juice. Add hot red pepper, salt and black pepper to taste. Serve hot over pasta with Feta Cream. Bring the cream to a simmer in a small pot over medium-low heat. Stir in the feta and let the mixture bubble for a minute, until the feta begins to dissolve in the cream and the mixture thickens. Serve hot over pasta with Spring Greens. This entry was posted in gardening, Good King Henry, greens, main courses, recipes and tagged feta cheese, Good King Henry, main dishes, pasta, perennial greens, spring greens by Cold Garden Warm Kitchen. Bookmark the permalink.